First of all, I want to say that this might be my last post on here using my MSN. Just got notice via my son that my new laptop has been shipped yesterday and will be here tomorrow the 12th. Now this blog may not be published till tomorrow either. Depends how soon that Kim gets the pictures in. Here is the start of my Christmas decorating. I went looking for a 3 foot tree for this spot with the lights on it. Went to Michael's; Nothing but pink or yellow. The rest all too big. So stopped at Joann's which was on the way home and this was the best they had. It's nice and full and really doesn't look bad after I went to the pharmacy in Boonsboro for medicine and looked for a short string of lights which they had, but also up on top of one of the display cabinets was a line of these cute little trees with white lights. UGH why hadn't I looked around there this past week. I'm in there at least twice a week. I got the colored lights and it really looks cute but will be better with a few tiny balls which I haven't brought up yet from the basement. The next thing is I have most of my trees made. Need two green and one red for that 6th row up and down. My version and it is looking better all the time. These are so much fun to sew. You don't have to be perfect about them. Only getting the tree tops to come out not cut off.. These have not all been squared up but there is plenty of room on all sides to make them the size you want. I think I will put a single inner border and then use all the scraps left from cutting these out of fat quarters to make piano keys for the outer border. Might not have enough to go all around but will fill in with pieces of fabrics used in the blocks. SO this is what I'm going to do. Kim said she would do this if I wanted to send the pattern back but NO. Why shouldn't I have a pattern give-away? Yes, Starting with this post if you would like to make these trees like Kim and I have made, just leave me a comment saying you want it. On next Wed. the 17th of Dec. I will pick a name from all that want it and it will be sent out as soon as I get your address. Kim, you know I love you. Now here also is some more of the old templates. Seems like this one could be used a number of ways. 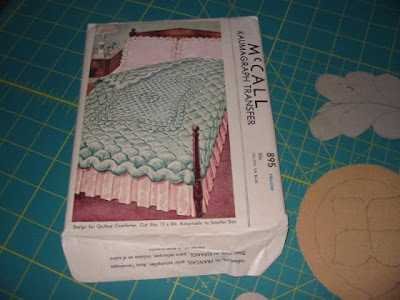 In the corner is a McCalls pattern for making a all over quilted quilt. We call them now WOW or White on White. 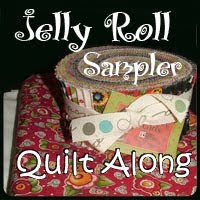 Great for showing off you hand quilting. This is a closeup and the stamped pattern is inside with directions. I've done two of these. The first one I bought the pattern in an Amish community quilt shop in Ohio. I marked it all myself copying it on the sliding glass door. I love that quilt. All hand quilted. Enough for this time and hopefully when the weather clears I can get some more pictures of the old Hotel. It looks terrific. Hoping to open in Mid February now. Keep coming back to see and don't forget about the giveaway. I love your tree quilt! Is it a Buggy Barn pattern? They are tons of fun! Eileen, you will LOVE your new laptop - I sure can't live without mine! Let's hope you get lots of comments...we definitely don't want Kim to get a big head (love you, too, Kim) - LOL! I'll help you out with a link to your giveaway on my blog....WOOO-HOOOO! Eileen, I LOVE your trees and would love making one myself! Hope you get lots of comments. I love your tree quilt, also. Please my name to the list of hopefuls. 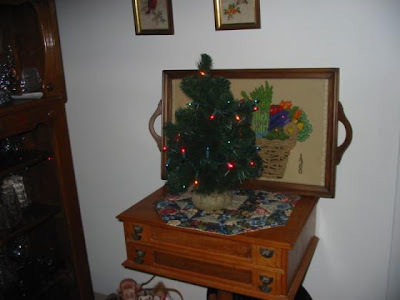 I love your tree quilt and the tree pattern would work sooooo well with my Christmas cottage Quilt, so I hope I win! thanks for the giveaway! Who wouldn't love to have those trees? Splendid showing on the tree blocks. Enjoy your new 'puter. Love the pattern!!! Candace at Squash House sent me over. Please enter me in the drawing. I copied your sparkler earlier today. I love your Trees! I liked Kim's trees, too. Hope you enjoy your new PC. I don't have the tree pattern, so please enter in your drawing. Your Christmas tree quilt is fantastic!! I'd love to get the pattern. The tree quilt is coming along nicely. Very pretty. Please count me in on the drawing. I love this pattern and if it's forgiving, all the better, lol! Also, I wanted to tell you, your picture at the top of your blog...the header (?) is gorgeous. After I saw Kim's on her blog and other ladies on her blog, I ordered the pattern from the maker herself. I got 3, 2 for gifts and one cause I told Santa I was a good girl. I dont need the pattern but yours is coming out wonderful. Cant wait to see it finished. I've always loved trees and this pattern really appeals to me. Looks like you did a wonderful job on your quilt. Please enter me in your drawing. Thanks. Your quilt looks great! Loved Kim's too! I'd love to have the pattern too. We can't let Kim have all the attention! :) Please count me in for the pattern give-away. Read about your giveaway on Kim's blog - so if you beat her tell her she has no one but herself to blame! I'd love to win the trees! Your tree quilt is so nice, I really like it. I would like a chance to win the pattern and make some trees too. I love your tree quilt. You have a wonderful sense of color when choosing fabrics. I really like the neutral color with the green and red. I hope to be the next recipient of the pattern. I love my laptop but whoa, watch out. I spend so much time reading all the blogs. That equates to much less sewing time. Love, love, love your tree quilt....and would love, love, love to win the pattern! Looks like your getting lots of comments! Eileen, I love your tree quilt. I would love so much to be able to make that. I've been searching for the pattern but no luck! Enjoy your new laptop; it will be so fun for you and you are one of the most on the ball people I know, so learning to use it will be a breeze! love your trees, they look really great. I love these templates you have shown, so very cool! Isn't that Tree quilt fun and easy to make? I love mine! SInce I made one and have the pattern you don't have to add me to the drawing, thanks! First time I ever left a comment on a blog! I love, love, love your trees and have admired Kim's, as well. Good luck with your new laptop. I have had mine for a year and still feel like 'queen for a day'! Eileen, great job on the tree quilt. Anxious to see it after you have added the border. Would love to win this patten. Have not done a quilt with this type of method with freezer paper, and it looks like it would be a good one to try. 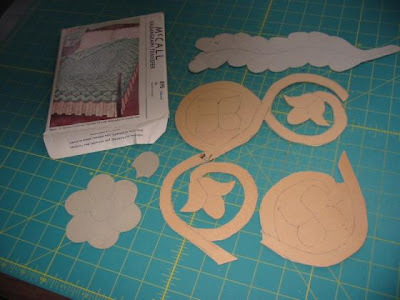 I remember back in the early 60's watching my Aunt Virginia tracing her cardboard templates onto her fabrics and then cutting out with scissors. She hand pieced her tops and completed the quilting by hand. We are so spoiled with all the new quilting tools of the 21st century. Love the tree pattern, could you post who makes the pattern, so those of us who don't win it can purchase it. I think it is great that you and Kim are passing along patterns. . .Merry Christmas. Thinking of you today. Got my cup of tea and stopped in for a minute. Love the quilt. Please do not include me - I ordered one through my favorite quilt shop Bearpaws and Hollyhocks a couple of weeks ago. My daughter-in-law (heart) picked out fun materials in turquoise, greens and reds. It should be cute, different then yours and Kim's, but cute. We were lucky, we were able to get all the material at 40% off. I'll sew it later on in the year and will send you a picture when I get it finished. Cheerio - enjoy your son being home. I love your tree quilt. I have made one of these in the red/green/cream colorway. My friend has one that I posted on my blog that shows it made in black/pink/and white. Really cute, stop over and take a look at it if you would like. I hope your new computer works well and that you like it! I do love those trees, they look funky and fun at the same time! I would love to win the pattern! 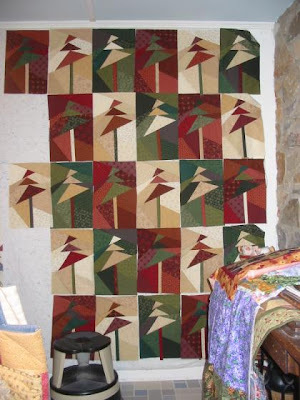 I love the tree quilt, I have done several quilts using their patterns. I'm from the eastern shore of MD. it's not so cold today, and should be 65 tomorrow. That's okay my me. Good luck with your laptop....you can do it. I would love to have such a great pattern. You and Kim did such a good job with it. If I am lucky enough to win it I will have to work very hard to make a quilt in the same league as you too. If I win the tree pattern, I'm sure I'll have time to get it done before Christmas 2009. It's wonderful! I'd love to win that pattern, they are so cute. Merry Charistmas. Very cute! I love it. Plz pick me! Hi Eileen, I'll help you get lots of comments! I'd love to win that tree pattern... I saw it on Kim's site and when she said you were going to give away the pattern, I knew I had to come say 'hey!'. That looks like a Buggy Barn pattern. I have made one quilt to using that method and it is so fun. I love yours. Can't wait to see it finished. I would love to be in on your drawing. I love that pattern. Hello Eileen & Merry Christmas! Good for you - learning new things like a new computer! I have faith in you that you'll be a pro in no time. I'm putting my name in the pot for your pattern giveaway and enough posts for you to beat Kim...LOL! Your tree blocks are looking great. Stay warm and hope your dh is feeling better. I'd love the tree pattern. Thanks for the chance. Count me in on the pattern drawing. You are going to be a computer whiz in no time at all!! Hope things are going well for you and your husband at this time. Have a great Christmas!! 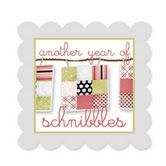 I just found your blog, thanks to my quilting friend Wendy. Add me to the drawing! Eileen, this is a beautiful quilt, and I would love to win the pattern. Pick me please!!! LOL I look forward to reading more of your blog! I LOVE the quilt. Would LOVE to try making it. My husband just gave me a laptop and my son set it up for me. You are the first blogger I have written, and boy it is different from the keyboard that I am used to! Having no mouse is odd for me, and scrolling is odd,too. Good luck with learning how to use yours. I think being able to go anywhere in the house with a computer is going to be fun. Your trees quilt is beautiful. I love that pattern. Please put my name in the drawing. oh pick me...pick me! trying to help out your competition with Kim! I would be happy to win the pattern. I haven't made a BUGGY BARN pattern in years. It looks like a lot of fun. Have a happy day and enjoy your new computer. I've been admiring this pattern on a number of blogs and, please count me in for the draw. Your blocks look fantastic.